Since I now have reviewed the HTC One in every way possible, I’m just going to do a short post now, noting on new findings and experiences. First up, here’s the links to all the previous HTC One reviews and more. I discovered a setting in the default web browser. Go to the web browser settings, accessibility and tick “dim screen while web pages loading”. A nifty battery saving tip. I have changed the auto brightness off. It’s too bright. I have a manual setting which works just fine. The HTC One also has USB on the go. So far I have tried connecting a USB memory stick and a small USB hub all of which worked fine. Unlike my Samsung Note 2 you do have to go into settings, storage and tap unmount USB before detaching from the phone. I also tried connected a Fiio E17 headphone/dac via USB. This worked really well, and I am pleased that the HTC One has USB audio out as a standard feature. As a comparison you can get USB audio out from the iPad Mini, iPhone 5 and older Apple devices, but as Apple control the authentication aspect, any USB DAC subsequently costs a premium due to the royalties Apple charges and their bespoke connectors. At least with the HTC One it is using a worldwide standard micro USB connection. 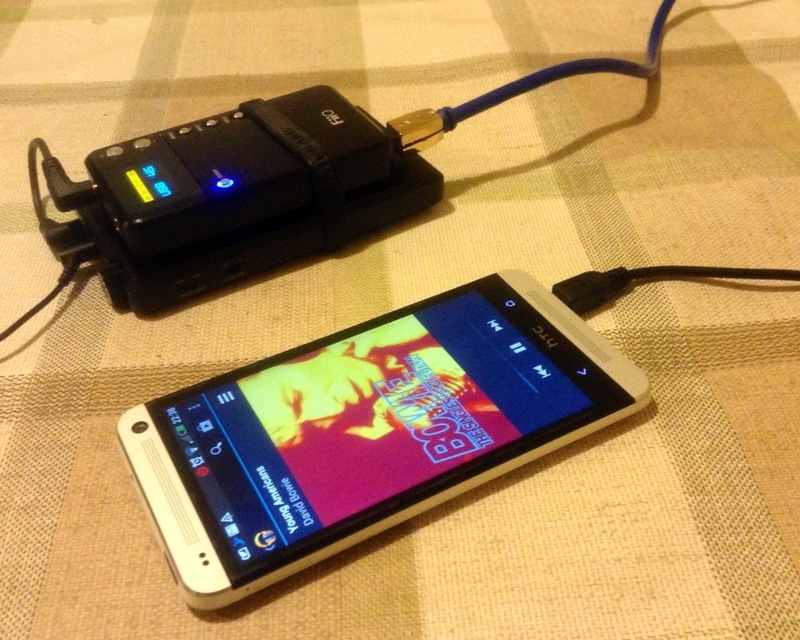 Connecting the Fiio E17 via USB to the HTC One, and using the DAC on the Fiio you begin to realise just how capable the One is in the audio department. Truly astonishing. And for the full affect you can use the Fiio E17 as a USB DAC only and feed the signal to the Fiio E12 Mont Blanc Portable Headphone amplifier, as shown below. Just to clarify for those not as technically minded, plugging the USB on the go cable (thats the small black cable coming out of the One) into the HTC One, then enables you to connect the digital analogue converter, and then that sends the analogue sound to the portable power amp. Your headphones plug into the portable power amp. Using this method bypasses the built headphone amp, DAC & Beats on the HTC One, but does provide a much cleaner and even better audio. No sound comes out of the speakers or headphone jack with this connection setup either. And the USB on the go cable also allows you to connect USB mouse, keyboard and more. I’ve only tested the USB audio and memory sticks but I’m fairly sure the others will work too. Does this setup improve the audio quality a lot? I have a Cowon i10 which broke couple of days ago and I’m really not happy with the sound coming out of the One. Do you know how it compares to the Cowon sound quality? Also, one more question, I can’t seem to find an equlizer settings in the stock HTC music player. Does it have anything like that or do I need to download a different app? I’ve been trying to figure out how to do this and it doesn’t help that I am a newbie to this stuff. I got the HTC One recently and haven’t done any rooting or anything. If I were to get an DAC/amp like the Fiio one you have there how would I be able to do it using Poweramp? Is there a tutorial or a step-by-step process I could find? And I have another questions. Is there a specific reason you wanted to bypass the amp on the e17 and use it DAC only or did you connect the e12 just to show that it is possible? I’m really jealous to see you have this setup working well. Thanks Gavin for all your awesome reviews! I did it to show how easy it was. Personally you may find you don’t need the e17 or power amp. Try using the default player with beats on or off. If you don’t like that try power amp. Using the e17 is as simple as plugging the USB cable into the HTC One. It just works. However the battery drains faster. You will need a USB otg cable. Really? I don’t need to do any internal setting before I connect a DAC? When I connect the DAC the One recognizes it to audio out via usb automatically? It’s ok if I have a male micro usb(into phone) to male mini usb(into DAC) cable right? That’s correct. It switches automatically into USB Audio. And sounds like you have the correct cable too. first of all thx for sharing your information with us. since waiting for both the e17 as well as the htc one i wonder where i can buy such a short, USB otg micro plug to mini plug cable, jon was writing about? has anybody a source or a link? micro plug to mini plug, not longer than 20cm and with otg functionality? so I’m too stupid to search for the correct terms. can you provide a link, please? okay, this is the standard, common setup. I don’t know if you have already seen the images of the e18, that will be delivered from november on with an ultra-compact micro usb male to mini usb male otg cable… and this is what I’m actually searching for. Does the phone charge while connected and playing? Have you tried something like this with the HTC One to see if it charges/plays at the same time? What has been your experience with the 4.3 update? I’ve done everything I can think of, including a factory reset. Let me know if you have any suggestions. My HTC One is a UK sourced rom. Most odd your issue. Have you spoken to HTC support? Do you know if this also works with an HTC One Mini? Just a Fiio 3.5m to 3.5m audio cable. cheers going to use this setup with my htc one. does the 3.5m go into the dac line out and the other end of the 3.5 into the line input of the amp. You use the headphone out. This is really interesting, I’m thinking about jumping ship from Apple. Currently I plug my iphone into my Marantz CD6004 which has a USB in socket and am able to play music from itunes but also stream any other sound (TuneIn and BBC iPlayer for example) through the CD player’s DAC, no problem it just works. I do the same with a Yamaha TSX140 in another room. Do you think I would be able to do the same with the HTC One? The HTC One has USB audio as standard. I don’t know what works or doesn’t work when it comes to the dac. Thank you, looking at the specs I think it should work then. Do you have to use an on the go cable then an a to a, or will the standard mini usb to usb a cable work? You need the USB otg cable adapter. They are only a few pounds on eBay. Before you go crazy buying stuff, have a listen to the HTC One just using the headphone out. It has a good sound with the beats eq. USB Audio out drains battery really quickly. Thanks very much for taking the time and sharing your knowledge. Great blog! Thank you too for your great comments! Nice review. Undoubtedly the best Android phone made to date. Thanks. Glad you liked the review. Do you remember me? I left a comment back in June asking about using the e17 with the one. I was using it fine until the last firmware update on the htc one. After the firmware update, the one does not play through the e17 anymore through usb. It says unable to charge in host mode when I connect them like I use to. The phone just keeps playing out through the speakers and that left me no choice but to use the aux input with a short 3.5. Is there any way to fix this and make it work like it did before? Not sure as I no longer have phone. The only suggestion Jon is to head over to XDA Developers Forum as I am sure people have worked out how to get this sorted. Thanks, I’ll check it out over there. Same on my HTC One with the e17 through USB audio. You can get it to work without resetting. You have to unplug the USB OTG cable from the One and close the music player app by double tapping the home key. This process has to be repeating 3 or more times on some ocassions to get the audio to patch through to the e17. I’m hoping this is not an issue with the next software update. I also wish the battery didn’t drain so fast on the HTC One when using the USB audio out.